Yesterday, the unthinkable happened. 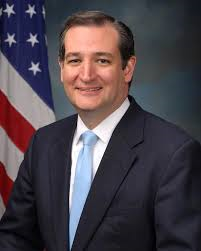 Texas Senator Ted Cruz, the so-called principled conservative, a man who bravely stood up to the Trumpkins who wish to forever destroy the conservative movement, decided to give away his political soul and endorse for president the wholly unqualified, liberal New Yorker, Donald Trump. I can't say Cruz "sold" his soul because, unlike Judas Iscariot, the Texas Senator did not even bother to get 30 pieces of silver for his betrayal of the conservative cause. Trump suggested Ted's wife ugly, retweeting an unflattering photo of Heidi Cruz juxtaposed next to a flattering picture of Trump's own wife. Trump threatened to "spill the beans" on Heidi Cruz. Trump suggested that Cruz's father was involved in the Kennedy assassination. Trump's buddies at the National Enquirer published an expose of Cruz's supposed extra-marital affairs that appear to have been completely made up. Of course, Trump immediately intimated the story was true, saying the tabloid publication has a good reputation for factual reporting. Cruz, on the other hand called Trump a "pathological liar," someone who is "utterly amoral" and a "serial philanderer" Unlike with Trump's sordid attacks, Cruz's observations about Trump were backed by solid evidence. So too is the conclusion of Cruz and other Republicans that Trump is a con man who is completely unqualified and unfit to be President. But first, we should dispense with some of the reasons fans of this decision have been offering. They, and by they I generally mean Trump voters, say he is choosing the good of the country over the good of the conservative movement. Impossible. Conservative values and policy ideas are good for the country. Trump's ideas are bad for the country. Dumping the former in favor of the latter isn't doing something good for your country. Stopping Hillary is an admirable cause. In the abstract. But that's primary season talk. That ship has sailed. There are now and instead two Hillarys running; they both have dumb hair, they are both older than dirt, they are both pathologically incapable of honesty, and they are both big government liberals determined to destroy the conservative movement forever. If you believe, as some do, that she's even MORE destroy-happy than Trump is, then try to stop her. Many good people have made that choice. But don't try to turn it into a virtue. That's what the monsters do. In a classic case of projection, they cast upon #NeverTrump that which they are the most guilty of. Namely, they accuse the #NeverTrumpers of sanctimony or condescension. A laughable complaint from the people who never stop piously bragging about how they are putting country first or how they are stopping the real threat, and in this Cruz is no different. Say you want to stop Hillary. Don't martyr yourself as making some big sacrifice for your country. It's gauche. The Stop Hillary At All Cost movement is, frankly, stupid. Donald Trump is the male version of Hillary Clinton. He is a big government liberal, and has been a big government liberal his entire life. The major difference between the two is not the policies they would pursue in office or their (lack of) honesty, but their competence. I loathe Hillary Clinton, but at least she is qualified, intelligent, and has the temperament to be President. Trump, a simpleton of a man who can be baited with a Tweet, has no business being anywhere near the White House. I don't even want him to be allowed to visit. I was never a big fan of Ted Cruz. I think his caustic, take-no-prisoners approach to politics is harmful to the conservative cause. But at least he stood consistently for conservative priinciples (though he abandoned some of them in response to Trump during the campaign). Now he has abandoned the conservative movement all together. Who would have thought when the going got tough for American political conservativism that the the real heroes would be people like John Kasich, Mitt Romney, and the Bushes?